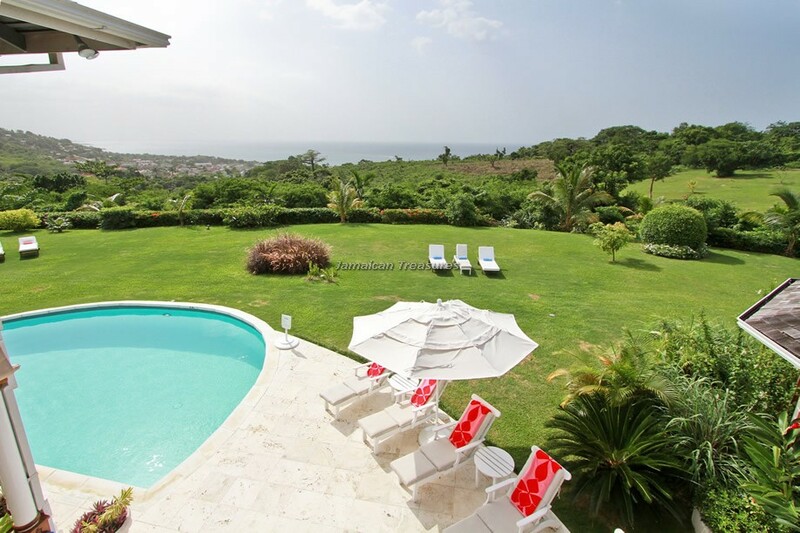 Rose Cottage is a fabulous new villa in Tryall, perched dramatically on a plateau, offering extraordinary views of the surrounding mountains and ocean waters. 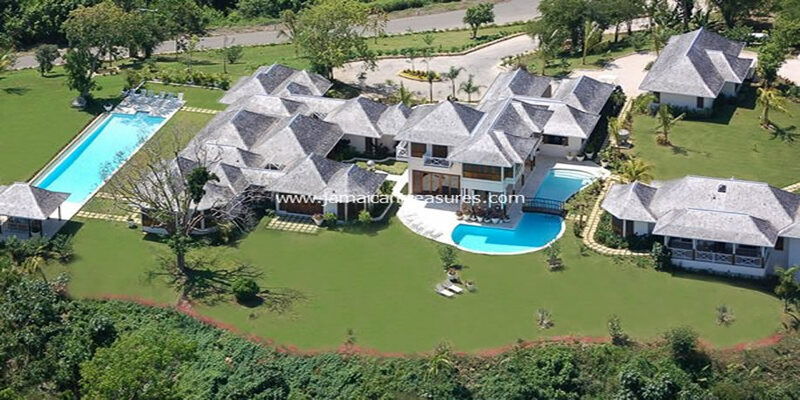 The traditional Jamaican styled luxury villa Jamaica was designed by Nancy D. Maffasanti. 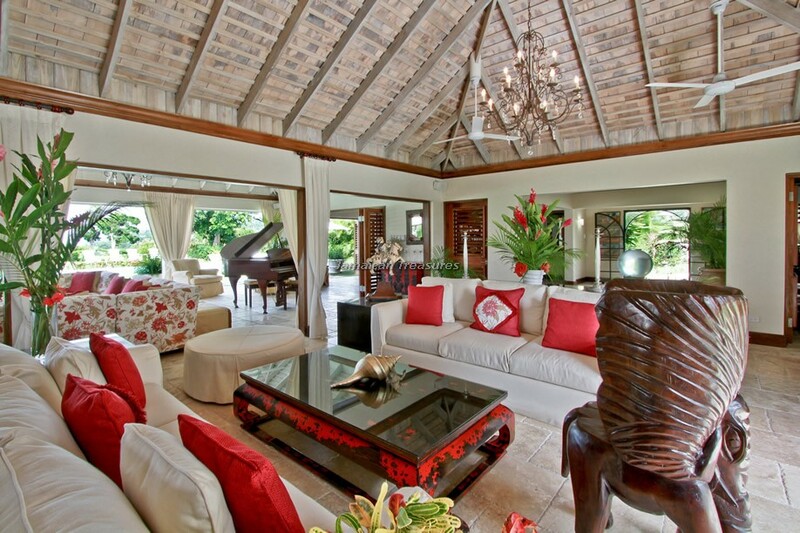 The décor is elegant and influenced by Asian, Jamaican and European lifestyles. 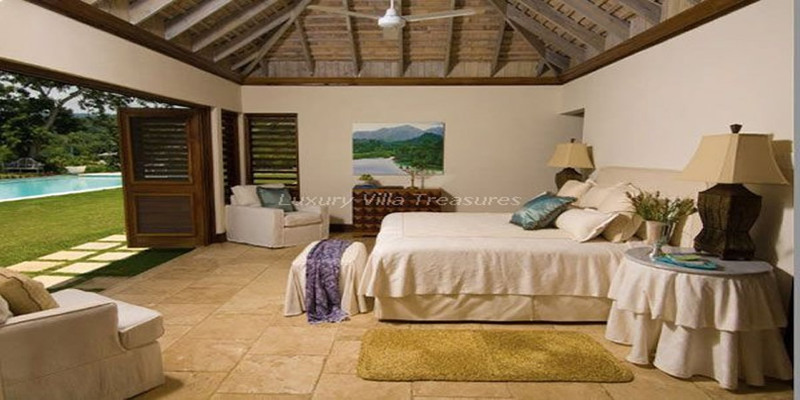 Being very elegant, yet comfortable, the Jamaica villa is designed to be enjoyed. 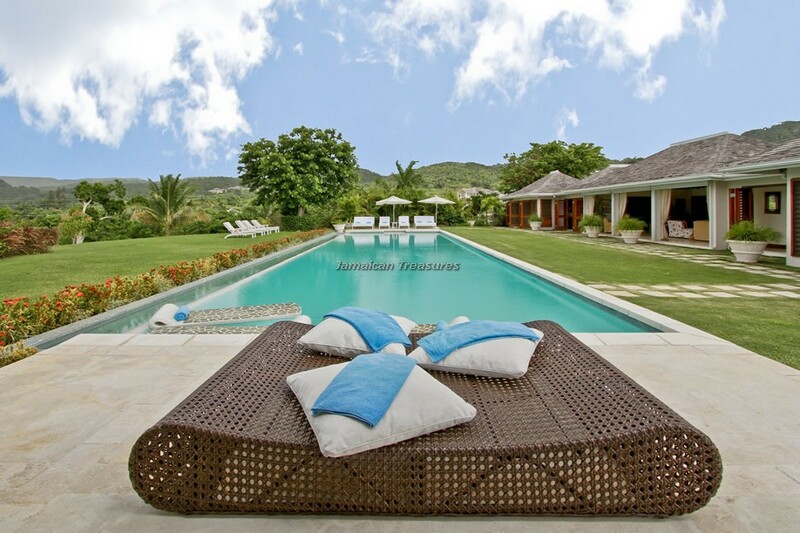 Rose Cottage has two large swimming pools and is surrounded by expansive beautifully landscaped tropical gardens. Its many pavilions exhibit elements of design that promote efficient cooling and warming through natural ventilation. 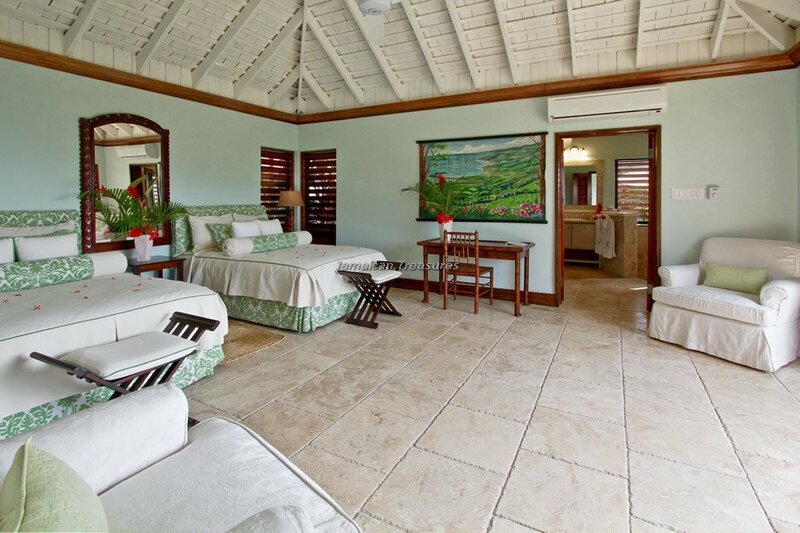 Furthermore, all rooms have ceiling fans or air conditioners, and even both. 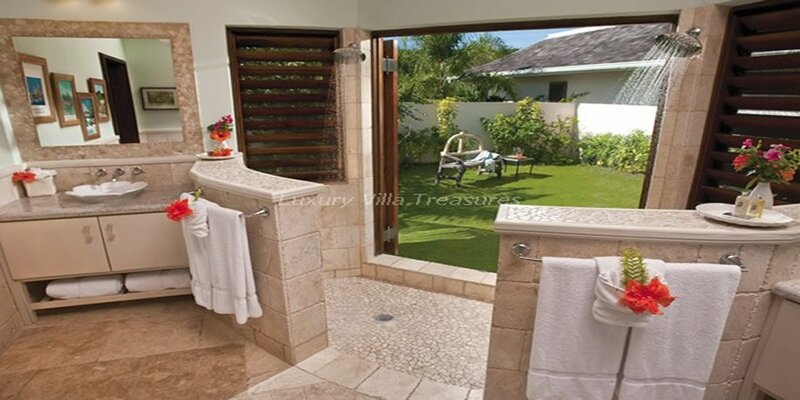 The main villa at Rose Cottage has four bedroom suites, a private garden for a unique tropical shower experience. 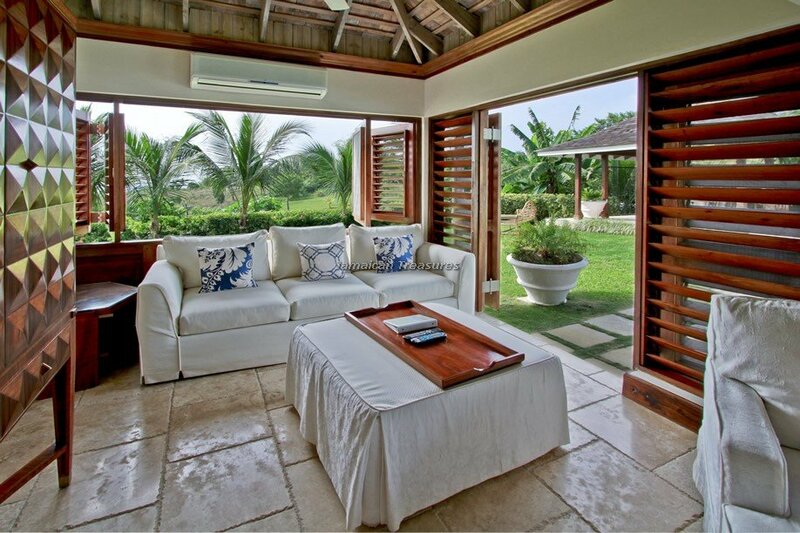 The Master Pavilion bedroom suite has a sitting room equipped with the audio-visual equipment, beverage refrigerator and icemaker. 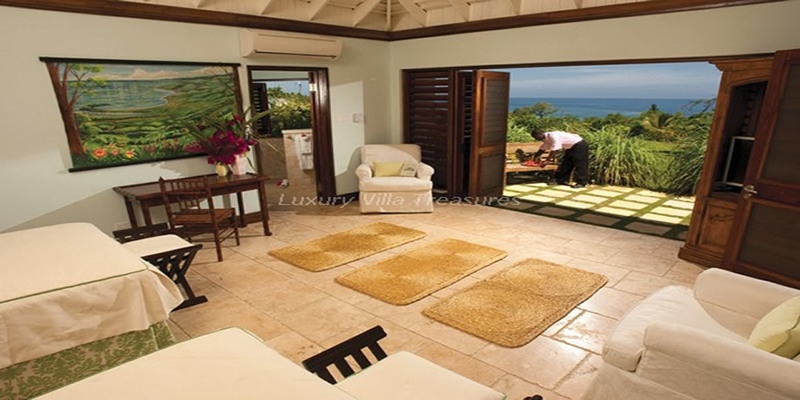 The Rose Bud, is a 1,900 square foot one bedroom cottage with a full master bathroom and a sitting room, a powder room with a shower, a verandah and a bar. All bedrooms have brand new Plasma televisions, air conditioning and ceiling fans in all bedrooms. 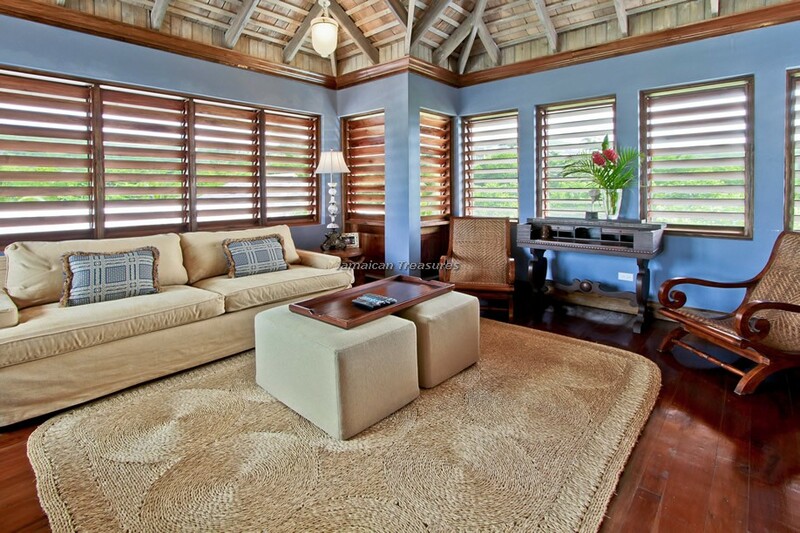 Rose Cottage’s formal living room has a 65 inch Plasma TV. 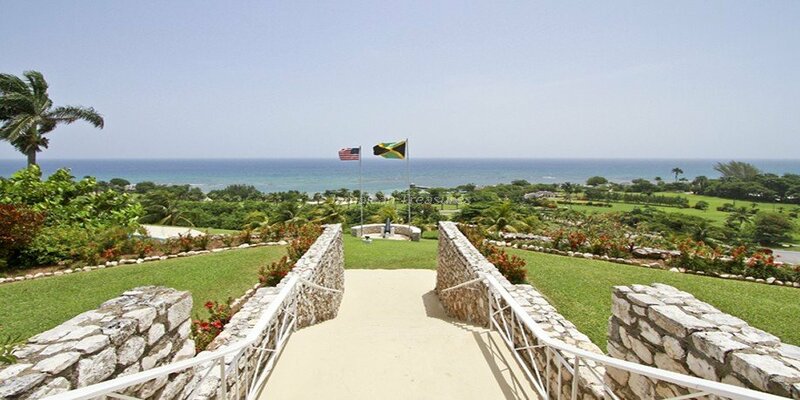 An open study and an open veranda and great room provide fantastic views of Montego Bay. 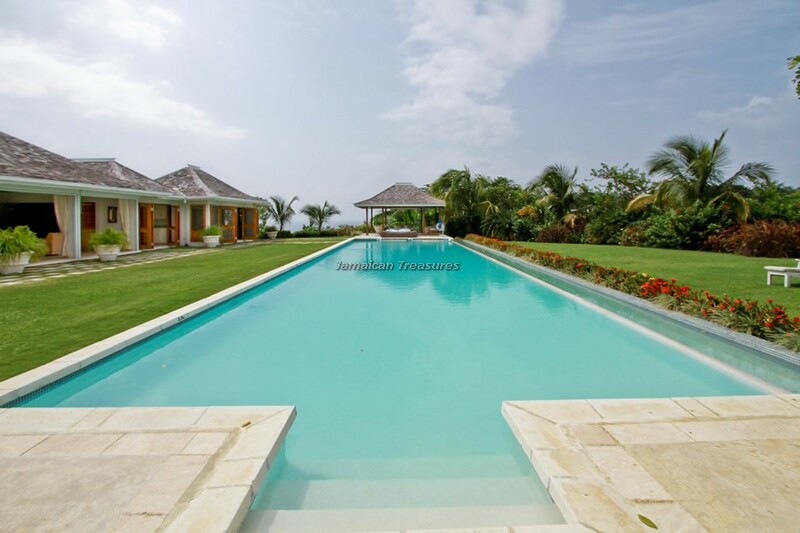 In addition to the 75 foot infinity lap pool and its gazebo, a large garden pool envelopes the south side of the elegant dining room. Its beautiful pavilion is the place where many meals are served while guests enjoy spectacular sunsets. 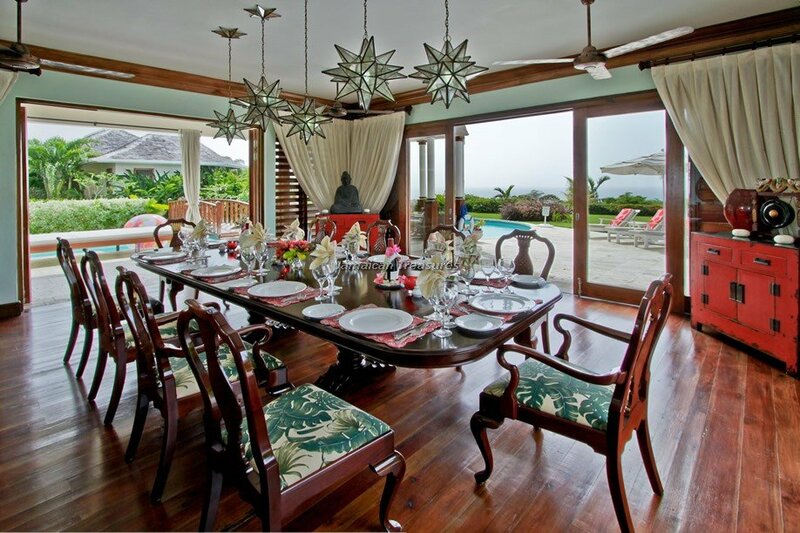 The formal dining room has a 360 degree view of the property and a spectacular sunset view over Sandy Bay. Rose Cottage is equipped with all essential contemporary conveniences, including telephones, computers, wireless internet, cable and various audio-visual gadgets. 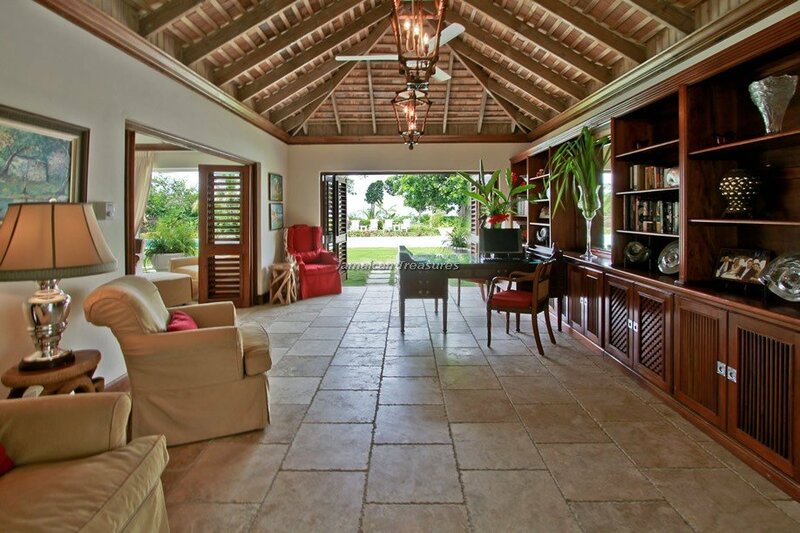 Other amenities of Rose Cottage include in the living room, large study, open atrium, courtyards. 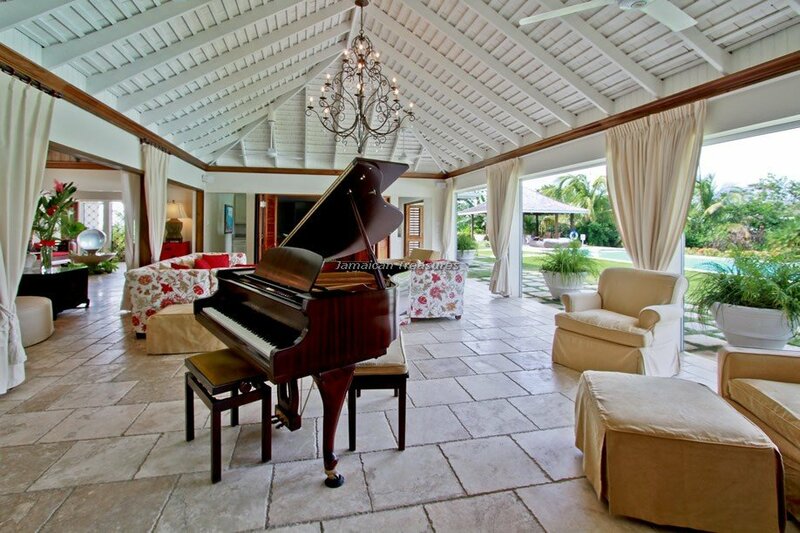 There is also a grand piano for music lovers, internet facilities, computer and fax machine. 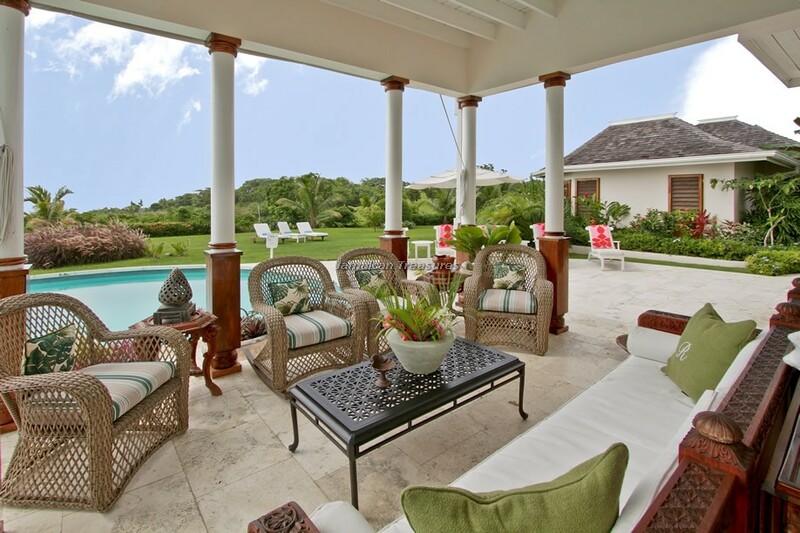 Enjoy your home cooked meals in the formal dining room indoors or outdoors overlooking the patio and swimming pool. 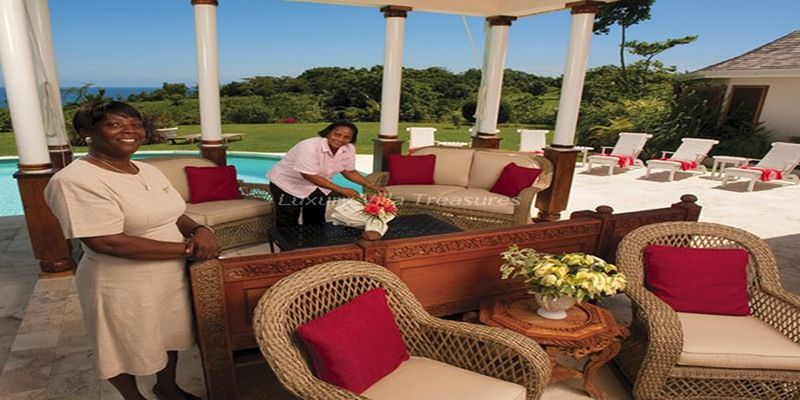 The guests at Rose Cottage are provided a private villa staff, comprising a chef, butler, housekeepers, laundress and gardeners. 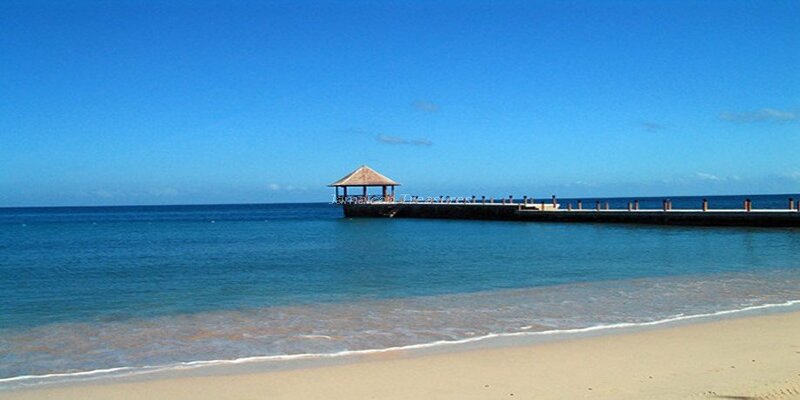 Additional staff can be arranged when required, including nannies or a pianist. 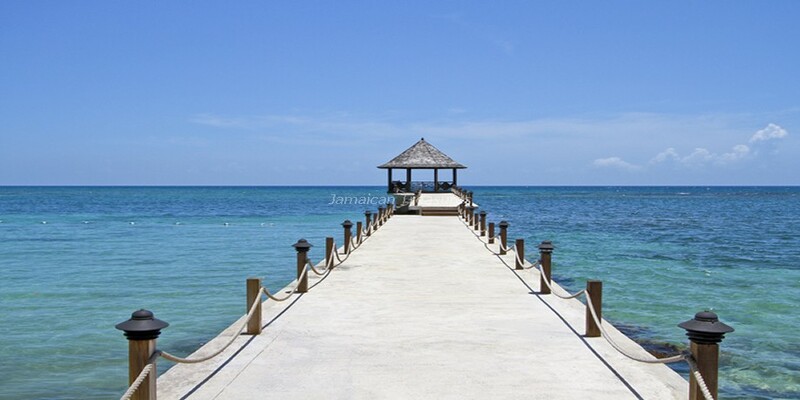 The staff makes this fabulous villa in Jamaica the perfect destination for the ultimate indulging experience, where they can put a little distance between them and the rest of the world. 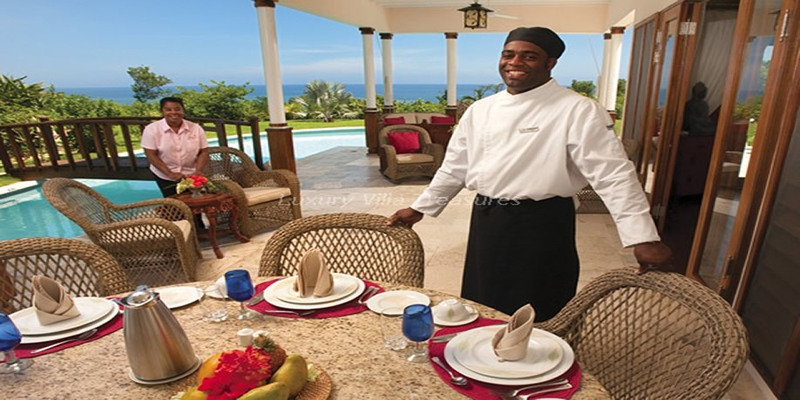 The chef is very experienced chef and works in the professional kitchen to create fantastic meals all through the vacation. The staff can shop for the guests at local markets and ensure the highest quality of fresh fruits, vegetables and meats. Rose Cottage has a non-smoking policy for indoor rooms. Ashtrays will be provided for the guests for outdoor use only. 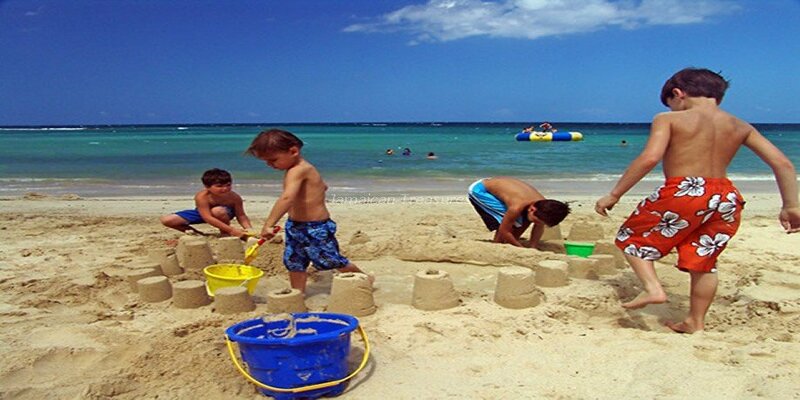 For the safety of children, guests are advised to ensure that no child under 12 be left unsupervised. Rose Cottage welcomes children and provides additional facilities for them, including 2 cribs, 1 high chair and a booster chair at no cost. 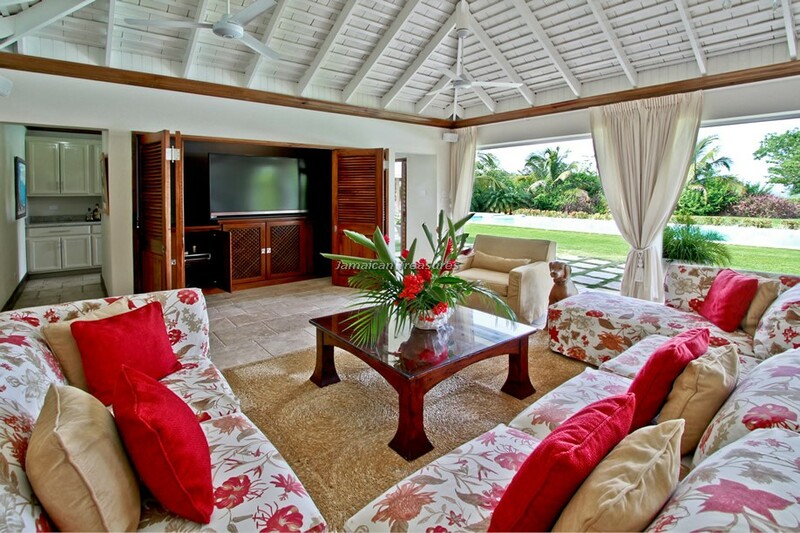 The living areas are children friendly at this very welcoming villa rental in Jamaica. 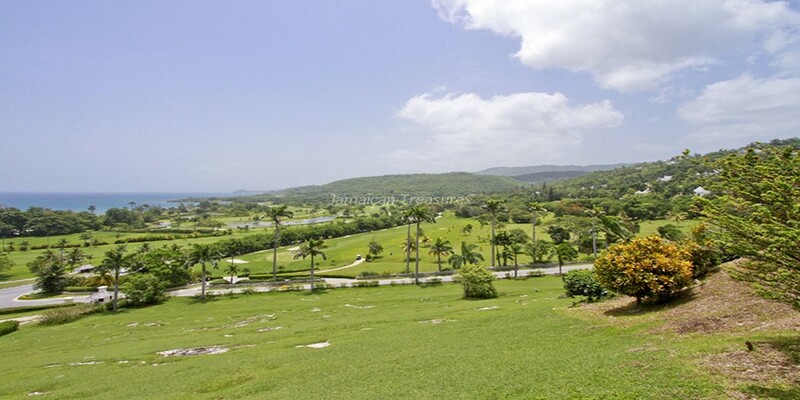 The guests at Rose Cottage are provided two complimentary golf carts for their comfort and convenience. 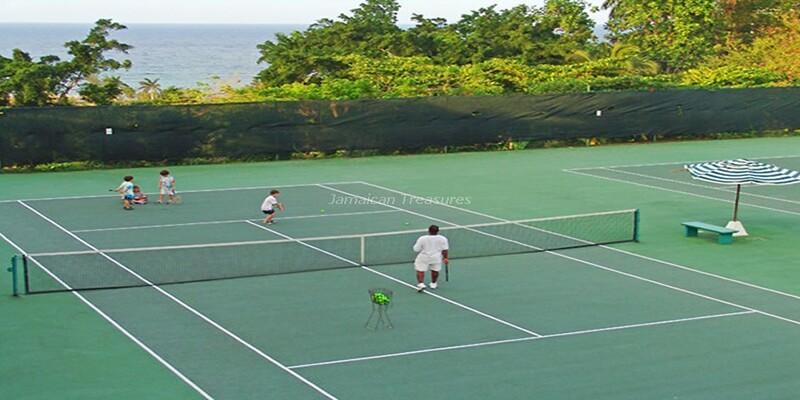 They may be used to travel from the villa throughout the Tryall Club. As per the club’s policy, the golf carts can be driven by individuals who are 18 or over. 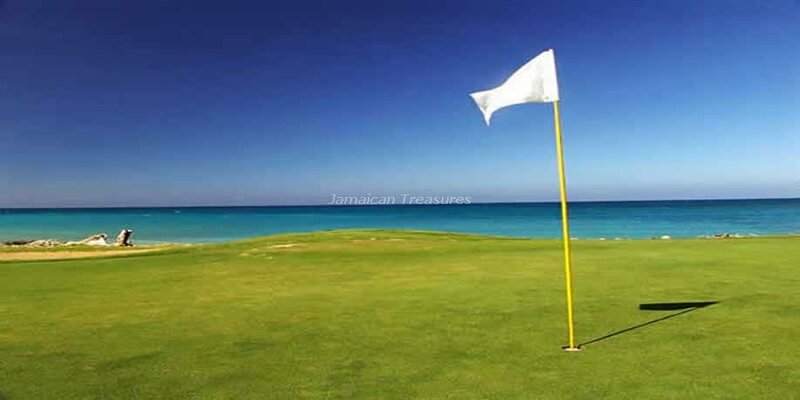 The Tryall Club community affords Rose Cottage guests complete access to its world ranked 18 hole hillside and seaside fairways golf course, pro shop, nine laykold tennis courts, beach and beach club, croquet course, spa, kids club and great house dining. 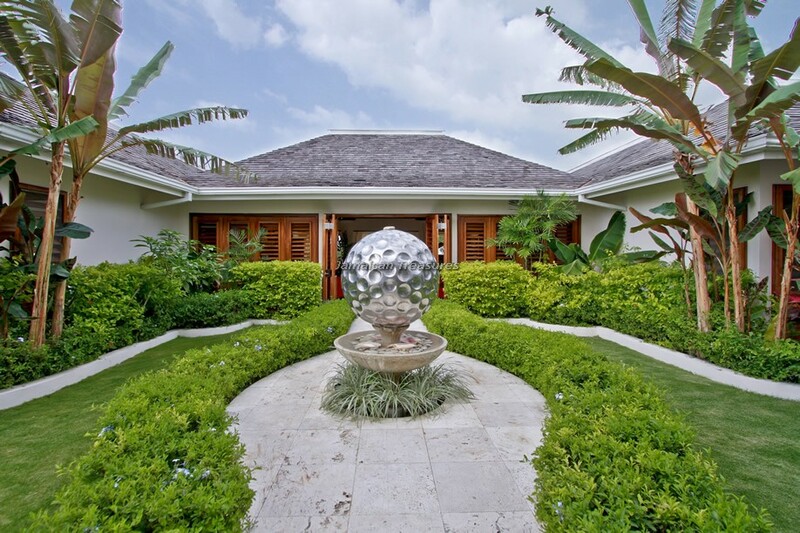 - Fully staffed with a butler, chef (equipped with a professional kitchen), housekeepers, laundress and gardeners. - Sirius music, DVD, CDs and IPOD adapters. 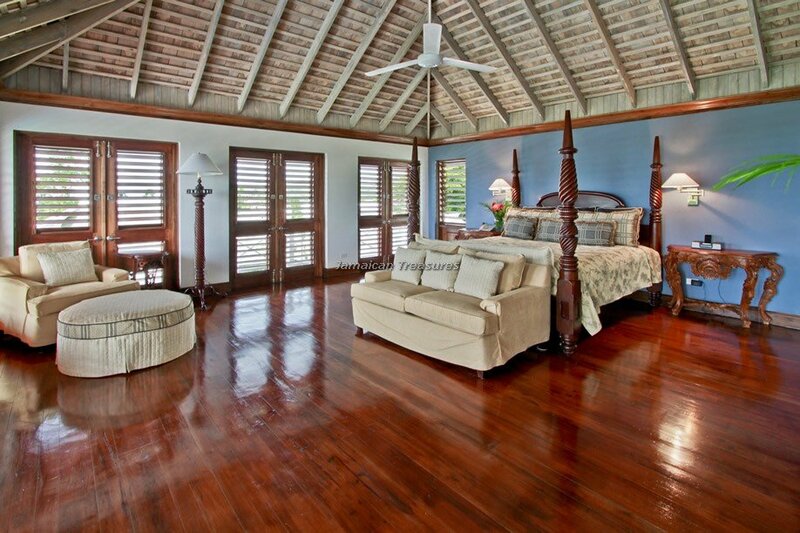 The Master Pavilion: Kingsize bed - This bedrooms is upstairs and its above the dining room with large jalousie windows on all sides including to balconies with views of the Sandy Bay shoreline and a distant glimpse Montego Bay. The suite is fully appointed with a substantial sized bathroom, separate sitting room with a very large television, snack bar etc. Rose Bud: approximately 2,000 sq. ft. Separate Cottage. 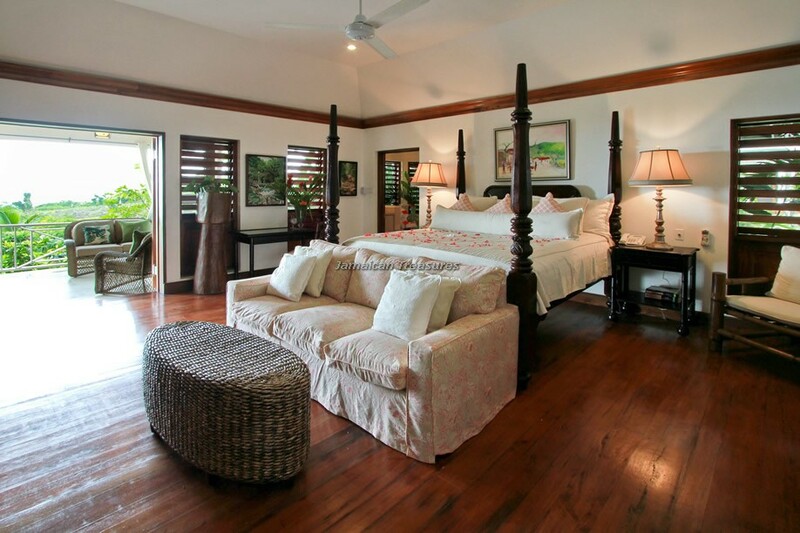 King size bed - The bedroom sits adjacent to the Garden pool has its own verandah, sitting room, a master bathroom and a secondary bathroom and a separate bar off the verandah. 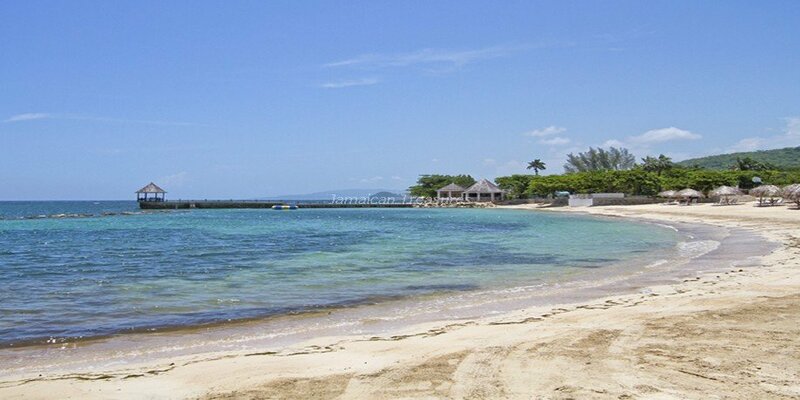 Moon Dance: has two full-sized beds, views the Sandy Bay shoreline and has its own patio which is partially screened with lemon grass. 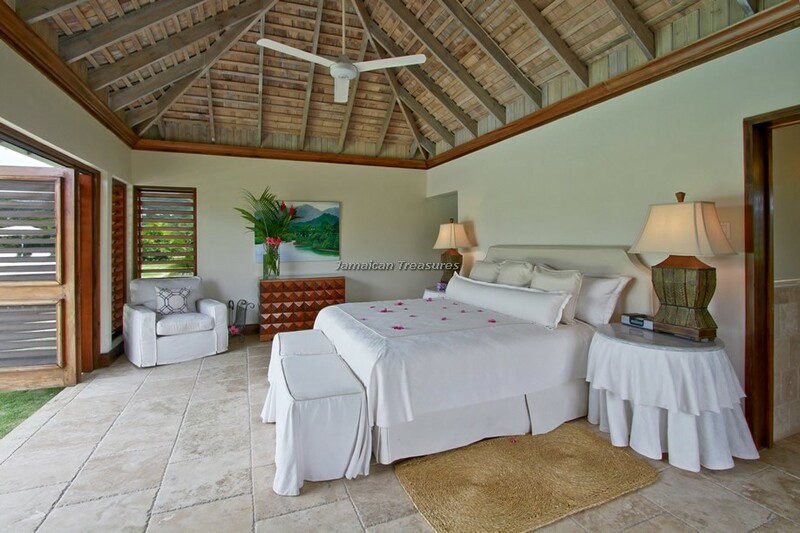 This bedroom has privacy and is very romantic - it provides for a shower with doors fully opened, or partially opened jalousie, which affords the experience of showering to your private garden. 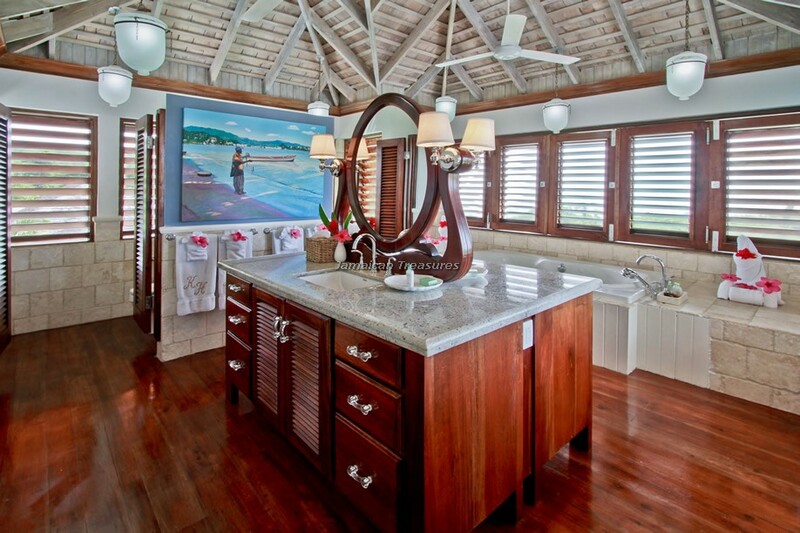 Bathroom at Rose Cottage with Double sinks and walk in shower. 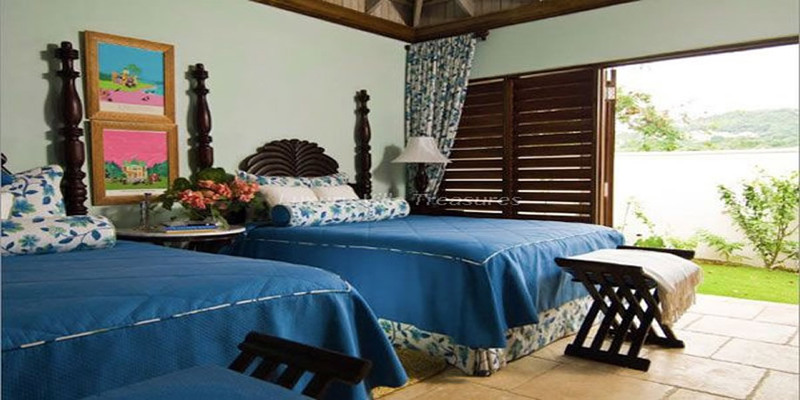 There are brand new Plasma TV's in all bedrooms, all bedrooms are air conditioned with ceiling fans. 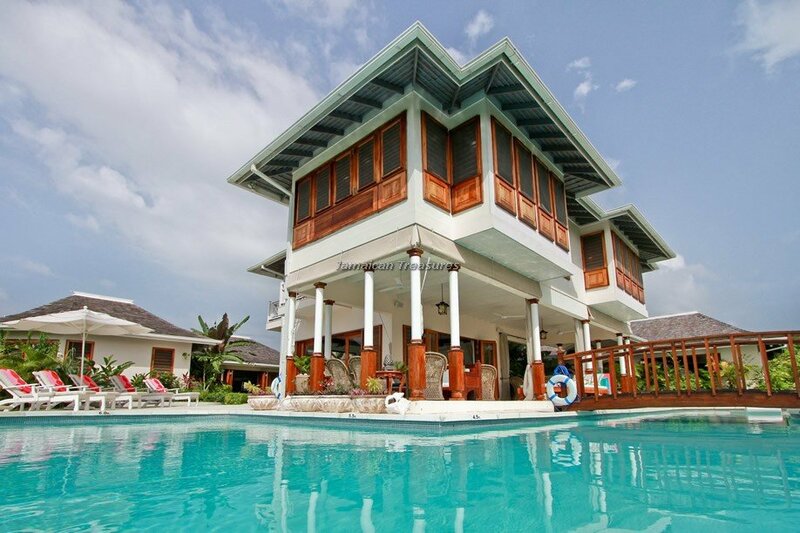 The living areas are children friendly with a large infinity swimming pool to enjoy. 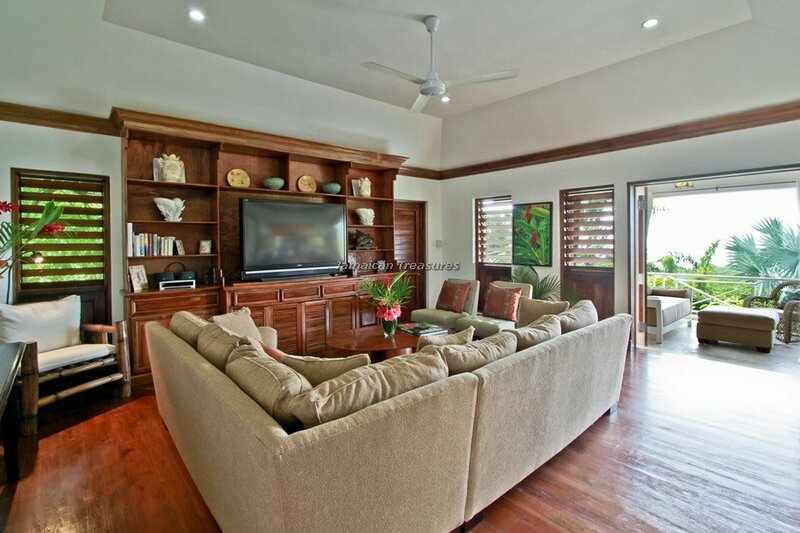 Other amenities of Rose Cottage include 65 inch Plasma TV in the living room, large study, open atrium, courtyards. There is also a grand piano for music lovers, internet facilities, computer, fax machine. 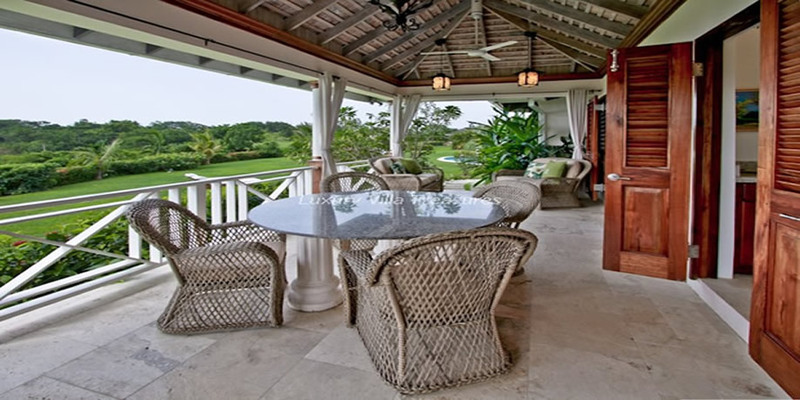 Enjoy your home cooked meals in the formal dining room indoors or outdoors over looking the patio and swimming pool. 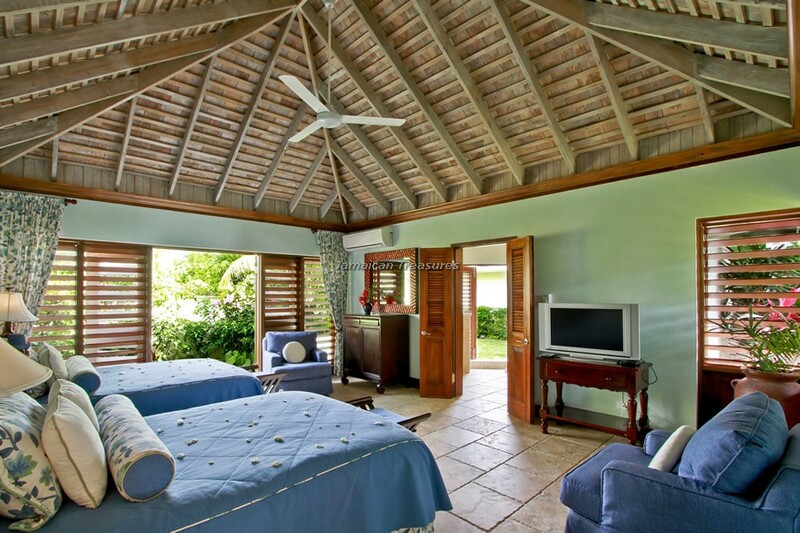 All bedrooms are fully air conditioned with ceiling fans, own ensuite bathroom. Rose Cottage supplies 2 cribs, 1 high chair, 1 booster chair at no cost.